When Muscle Milk was first introduced, we attempted to emulate human mother's milk, one of nature's most anabolic, complete and balanced foods. In doing that, Muscle Milk created a new category of protein products, while setting a new standard for both taste and performance. 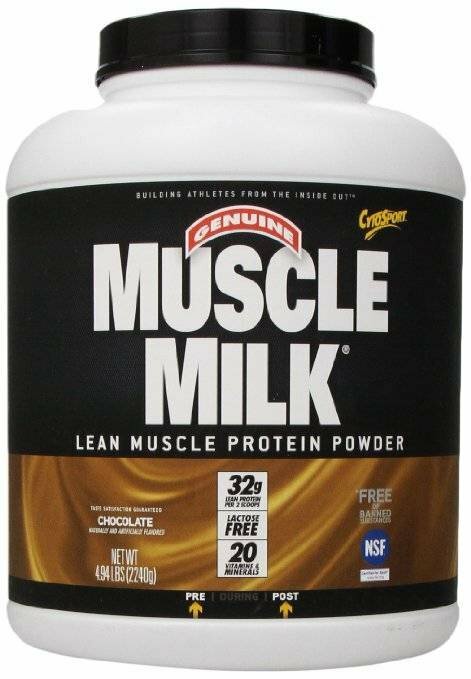 As a result, Muscle Milk has become America's favorite protein drink. PRECISION PROTEIN BLEND Muscle Milk contains a precise blend of proteins designed to create the optimal environment for exercise recovery and muscle growth. This precision protein blend contains rapid releasing whey and slower digesting micellar caseins from milk protein isolate/concentrate plus calcium and sodium caseinates. This creates a constant supply of amino acids, the building blocks of muscle tissue. CHOOSE THE RIGHT KIND OF FAT! The LEAN LIPIDS used in MUSCLE MILK are more likely burned for muscle energy and heat than stored as fat. Medium chain triglycerides (MCT), the pre-digested, fast-burning fats help provide the caloric energy needed to fuel exercise and recovery. Polyunsaturated and monounsaturated fatty acids from canola and sunflower oil provide essential omega-3, 6, and 9 fatty acids. CHOOSE CARBOHYDRATES WISELY Low-sugar, high-fiber complex carbs are an important part of a healthy, active lifestyle. The starch-based complex carbs found in Muscle Milk supply energy to the body in the form of glucose. Glucose is the only energy source for red blood cells and a preferred energy source for anaerobically exercising muscles.